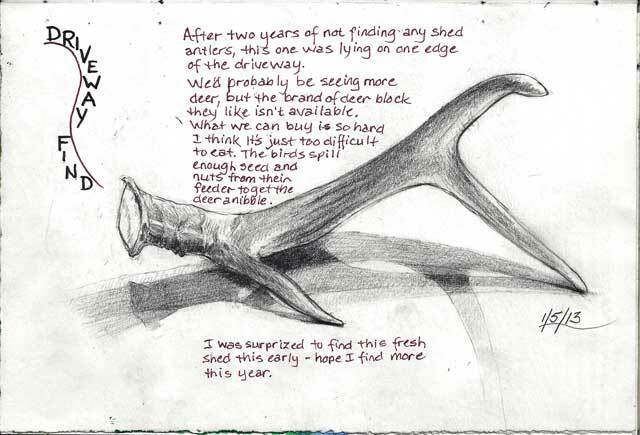 As I noted on the journal page, I haven't found any sheds in a couple of years, so I was pretty happy with this find. After making the above sketch yesterday, since the sun was out, I took the dogs for a hike and to soak up some vitamin D. When I got down into the draw next to Uncle Al's property, I saw that the little seasonal stream, despite temps in the teens was still flowing. Snowpack is down, so I hope this moisture is being stored below ground somewhere down hill. On the way back I spotted a small pile of moose poop - different from elk or deer because it's a light tan color. The pellets weren't very big, so from a younger animal, and probably what the dogs were barking at early this morning. My next find was another (!) shed whitetail antler. I gave a "woo - hoo!" and looked closer. By now I wasn't very far from the house, and I was anxious to compare this antler with yesterday's, and it certainly looks to me like they are a pair. The one on the left was Friday's find. This led to another sketch for my journal. Both antlers had been shed pretty recently; the bases still had a bit of pink to them.